There are authors I know who say they would rather die than ever show their first attempt at a novel to the world. In the Fall of 1987, my English teacher decided that she wanted our class to write in a journal every day. I did not like this teacher and decided I did not want her knowing anything personal about me, so I announced in my first entry that I would be writing an ongoing story for the duration of the class. Now, this teacher wasn’t that sharpest tool in the shed; she did not seem to notice the speed at which my writing improved and my journal entries lengthened. She did not care what I wrote (if she even read it)–it only mattered that there was a date listed beside every entry so she knew where to make her check mark. She never spoke to me about my broken idea of plagiarism, this fear of copying someone that kept me from writing at full speed until many, many years later. Now that I have fully entered the 7th Grade Edition, I will be posting the new edition, in installments, also on WattPad. It will be called The Golden Band (High School Edition). I encourage you all to check out the story, follow along, and make comments as you see fit. 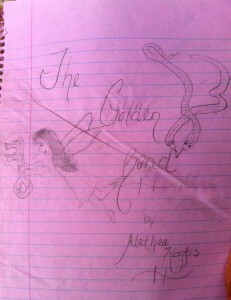 Above all, I hope you enjoy this peek into the time capsule from the Life of Alethea Kontis. This entry was written by Princess Alethea and posted on June 25, 2013 at 10:55 am and filed under life, writing. Bookmark the permalink. Follow any comments here with the RSS feed for this post.